Xpress Precision Engineering B.V. - Metrology, optics and precision machine design. 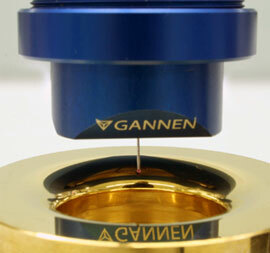 Sensors in the Gannen probe series should be used in a temperature controlled environment to minimize thermal deviations. Thermal deviations, as measured with the Gannen probe are discussed in this section. For the measurement, the sensor is placed in a temperature controlled environment with a maximum fluctuation of plusminus 0,5 degrees. The measurement results show that for a measurement over 60 hours, the maximum top-top deviation in any 20 minute interval is 2 nm. In the graph above, measurements are taken at 10 second intervals and a running average over 10 points is taken to separate the effects of drift from signal noise. Also, the probe tip is not in contact with a work piece and hence the effects of thermal expansion of holder and stylus are not taken into account.